Home/Business and Finance/Medium-term outlook: cutting off recovery? Medium-term outlook: cutting off recovery? Oxford Economics’ Neil Gibson predicts a slow and painful regional recovery as Northern Ireland enters a new economic world. At the time of writing the Northern Ireland economy shows very little sign of emerging from its protracted recession, unemployment continues to climb, employment is falling and survey indicators are giving weaker readings than elsewhere in the UK. The levelling off of claimant unemployment at the turn of the year did not prove to be a turning point and attention has now shifted to the inevitable cuts in public expenditure. The outlook could at best be described as challenging. However, even in these challenging times there has been positive news. A number of private sector firms continue to perform strongly, especially those operating in export markets, output levels have begun to rise in both manufacturing and services and Derry-Londonderry won the competition to become the UK’s first City of Culture in 2013. This good news is against a bleak backdrop with the threat of significant cuts in public expenditure casting a long shadow over the economic outlook. 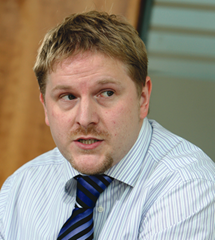 Though the cuts represent an opportunity for the region to orientate itself away from public sector dependence no-one should be in any doubt that this ‘transformation’ will be both painful and protracted. Oxford Economics’ latest GDP forecasts have Northern Ireland trailing the UK over the forecast period, with growth remaining subdued in 2010 and 2011 before staging a more rapid, if below UK rate, recovery. Even this slow recovery outlook is dependent on a number of factors, not least an improvement in consumer spending as personal balance sheets improve and strong world economic growth driving export demand. Both of these carry significant risk and as we set out later in this article an altogether more gloomy medium term outlook is worryingly easy to construct. Though it is GDP that is the ‘poster boy’ of economic growth literature it is in the employment data that the more ‘personal’ impact of the economy is felt. To most people (and therefore voters) it is the labour market that determines how the economy ‘feels’ to them. The Oxford Economics forecasts continue to depict a very slow climb out of recession, this has been a feature of the forecasts for some time and reflects the problems facing both consumers and the government in terms of ability to spend. Oxford Economics currently project it will be 2018 before employment regains its ‘peak’ achieved in 2008. As Figure 1 shows, the medium-term outlook is very different to the recent past and no return to the mid-90s to late-00s boom is projected. This post-debt era is being referred to as the ‘new normal’ in many circles, a recognition that the economic landscape will have changed irrevocably even when the recession lies firmly behind us. The result of sluggish labour market performance leaves unemployment higher than it has been in the recent past and well above the corresponding UK rate, throughout the forecast. We predict unemployment to stay above 6 per cent and it may rise to well over 60,000 people at its peak. Unemployment could be lower if net migration out of the region accelerates but at present there is little sign of significant outflows of people (Oxford project migration to be roughly in balance over the short to medium term). Equally, reform of the benefits system could distort this figure by moving people into unemployment from other benefits. Could the expenditure cuts trigger a transformation? Oxford Economics projects a loss of 8,000 public administration jobs over five years (a 13.6 per cent fall) and overall a fall in public sector employment (defined as the sum of public administration, education and health) of 12,900 jobs. Looked at in comparison to the era of expansion just past the change is startling (Figure 3). Even with the stark end to the growth in public service jobs, the contraction only reverts the sector to 2005 employment levels. A more severe contraction is clearly a possibility (though possibly politically unachievable). The cuts present an opportunity despite their clearly adverse impacts. As a region Northern Ireland has talked endlessly in economic strategies about the need to become more private sector-orientated and to depend less on the public sector. 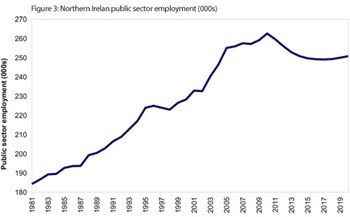 With the likely squeeze on wages in the public service (which now enjoy an 35 per cent differential in median salary rate compared to the private sector in Northern Ireland) expected to reduce its relative desirability as a career slightly and the potential for a shift towards more private sector delivered services there is the possibility of the economy being better balanced at the end of the process. 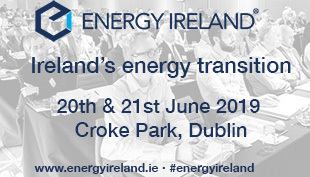 Equally the reduction in procurement may well force many firms to engage more proactively in export marketing and efforts to shift their client portfolio away from Northern Ireland public sector. Again this may prove a welcome turn of events and increase growth potential (and possibly demands on Invest NI). Of course, this transformative potential of public sector spending pressures will be lost if the cuts are not applied strategically and with an open-minded ‘output-based’ focus. The concern is that cuts will take place on a ‘budget line’ approach and with a focus on ‘cutting at the extremities’. This approach would involve slashing capital budgets, reducing funding for ‘arms length’ bodies, bringing back in-house previously sub contracted activities and cutting primarily on the basis of cost not the outputs delivered. The opportunity to move a number of public sector activities into the private sector and thereby creating significant new private sector employers should be at least considered. By way of example Belfast port, statistics departments and a wide range of administrative functions are all possible candidates that would attract private sector interest. Where might jobs come from? Given the prevailing economic mood it can be challenging to envisage where job growth may occur. The latest Oxford Forecasts place much of the weight of economic recovery (at least in terms of jobs) on the business services sector, though notably growth is much slower than the previous decade. This is based on the assumption that a range of public sector activities will move into the private sector, just as it has occurred in the industrial sector in the last decade, and that professional services exports continue to expand as they have done recently. The skills profile and cost competitiveness of Northern Ireland gives some confidence that this will occur, but even in this most optimistic of sectoral outlooks risks abound. Elsewhere, growth in the leisure, creative media and hotels sector is projected, partly reflecting the potential in the tourism sector. Some recovery of loses in retail and construction will occur, but not in sufficient numbers to offset recent losses. Sectors such as environmental technologies, pharma, care for the aging population, data storage and processing also provide scope for jobs growth, though they are spread across a number of employment classifications and thus can be hard to identify in official data. 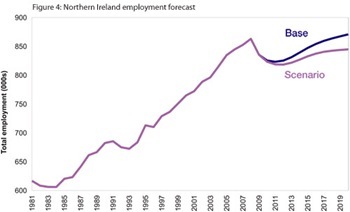 The baseline projections for Northern Ireland are challenging, especially in the labour market. Oxford Economics remains one of the more optimistic of the Northern Ireland forecasters and within their modelling suite it is worryingly easy to construct a more alarming downside scenario. If a more aggressive set of public expenditure cuts are modelled, the growth in business services is capped reflecting an inability of the sector to export and the construction sector is subjected to more aggressive capital cuts then the impact is stark. 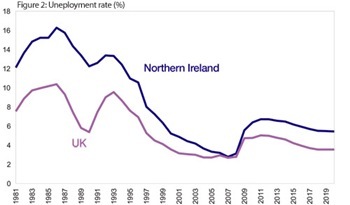 In this case, an outlook where Northern Ireland’s labour market does not recover its 2008 peak even by 2025 is entirely plausible and GDP growth averages just 2 per cent in the 15 years to 2025. Economic theory suggests such an outcome is unlikely. Costs would be driven down increasing competiveness and ultimately leading to growth, and migrants would leave in significant numbers, reducing unemployment (though this does have a further dampening demand effect). Simulations suggest such an outcome in the short to medium term has about a 15-20 per cent chance of occurring, this falls in the longer term. One of the most alarming aspects of even the base forecasts from the Oxford Economics model are the spatial implications. The forecasts suggest strength in the urban areas based around the strong professional services bases in these locations (most notably Belfast). However elsewhere the outlook is rather bleak. In fact, in the decade to 2020, the forecasts suggest a net job gain of just 13,000 outside of the region’s cities. In fact, in eight of the 26 council areas net job loss is projected. These forecasts are ‘policy neutral’ and do not reflect local initiatives that may be in place to help influence future growth. 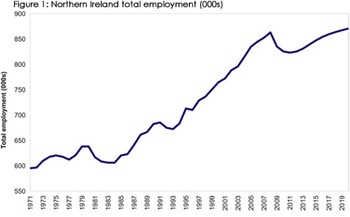 Nevertheless it is stark warning that if Oxford Economics forecasts of recovery, led predominantly by professional services, is correct and given current expertise and capacity in these sectors, then many parts of Northern Ireland are in for a very challenging decade ahead. This local analysis asks significant questions of a number of elements of public policy, not least the regional development and transportation strategies, and the wealth of published masterplans which predict a rather different (and retail-focussed) future for many towns and cities. It all begs questions over the suspension of the relocation of public sector jobs agenda; what else can drive jobs in many of the regions less prosperous locations? Equally, many of the urban areas are heavily dependent on public sector jobs at present, perhaps suggesting movement of jobs could be very damaging. Castlereagh has close to half its employment in public services and seven other areas have over 30 per cent employment in public services. At local level, forecasts are much less reliable but they provide food for thought in terms of the possible implications of a recovery that is not built on the public sector, retailing or construction – sectors which have been the dominant sources of growth in the recent past. The economic landscape has changed, the era of debt and public sector largesse is at an end. 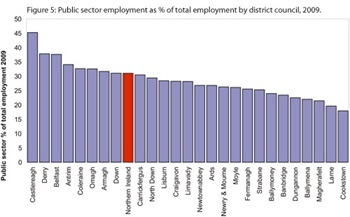 Repairing the UK public finances will take a heavy toll on a region such as Northern Ireland which depends so heavily on direct and indirect public sector employment. In the longer run this ‘squeeze’ on public spending presents an opportunity to move the region towards a more private sectororientated economy, something it has long professed to want to do. There will be job losses, the private sector is likely to do the same tasks for considerably less labour, and this hampers recovery with the region forecast to take until 2018 to reach its 2008 employment. It is possible to postulate an even more challenging economic forecast by making more severe assumptions on spending cuts and although this is not the most likely outcome it is important that policy considers how it may respond should it occur. The recession has not cost as many jobs in the short run as originally feared but the path to recovery looks extremely uncertain and job opportunities are at a premium meaning that for many, especially young people, an economic recovery feels very far away indeed.